“Walls are built for separating and protecting ownership. Once ownership of a parcel of land is claimed, boundary is established in the form of fences, property lines and walls. Once the borders are built, they can be defended, and most walls have a defensive process to protect them (p57). [But] men and women who build walls to protect their status or income or their sense of security risk also restricting growth in their careers and relationships. They also tend to fall into a very basic transactional approach in which every interaction demands a give and a take. They “do things to get things”, but, otherwise they hide behind the wall (p56). To exert positive influence, one has to be intentional because the instinct for self-preservation is too strong (as a result of the Adamic fall, mankind become self-focused and self-preserved to cover up his/her nakedness and shame). But as a leader, in order to leave a lasting legacy and to have a positive impact on the lives of others, one inevitably has to let go of the need to self-preserve. With leadership position comes a certain degree of power. What we do with this power is important – do we use this power to empower others, or to overpower others? 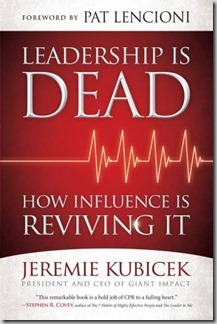 To be a true influence is similar to parachuting out of a plane. You need to understand the risks. You may be perceived as being too personal. You may not connect with the people in the way that you’d hoped. You may be shot down by comments form the person you are trying to help. 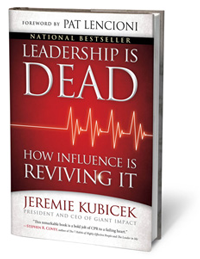 Nonetheless, although overall, I think this book is well-written with a timely message, I still feel that Kubicek’s style of writing is rather lackluster, devoid of that kind of “oomph” especially for such a catchy title like this. • Leadership should be seen as a means, not an end; a vehicle, not a goal. • To exert positive influence on others is an intentional effort. It requires hard work. Be selective. What is the margin between what they would say today and what you would want them to say later? In connection with the above question, I have created a simple free downloadable worksheet to help us map out our goals to exert positive impact on our circle of influence. Click here. “Leadership is alive when it is used for others. It dies when it is all about you” – Jeremie Kubicek (from the blurb at the back cover jacket).